Falcon 9 is a two stage, liquid oxygen and rocket grade kerosene (RP-1) powered launch vehicle. SpaceX, headquartered in Hawthorne, California, is a space transport company and developer of the Falcon launch vehicles and Dragon spacecraft. 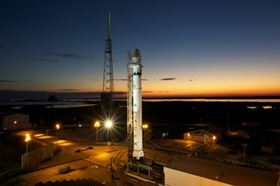 Following the retirement of NASA’s Space Shuttle Program, the Falcon 9 and Dragon system will initially take over delivery of cargo, and later astronauts, to the International Space Station. 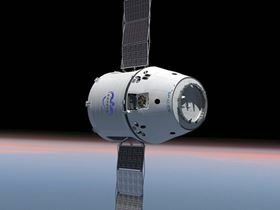 In May 2012, the Dragon (unmanned) became the first commercial vehicle to dock with the International Space Station. For the better part of five decades, commercial access to space has been limited by the high cost of flight operations. However, Space Exploration Technologies Corp (SpaceX) has rewritten the rules of the game by adopting a new business model and cutting edge technologies to enhance reliability and reduce the cost of space access. As composites have received growing acceptance in a variety of industries, including aerospace, the space industry has taken note. SpaceX was no exception. SpaceX’s Falcon Heavy (currently under development) will be the world’s most powerful rocket, with more than twice the payload-to-orbit capacity of the space shuttle, but at only one-third the cost. It is expected to be the first rocket to break the US$1000-per-lb-to-orbit barrier, less than a tenth as much as the NASA space shuttle. One significant way SpaceX decided to enhance the performance of its Falcon rocket and Dragon capsule was by adopting advanced composite materials. As composites have received growing acceptance in a variety of industries, including aerospace, the space industry has taken note. SpaceX was no exception. It recognised that composites could significantly enhance performance by improving the strength-to-weight ratio of the materials used to construct its spacecraft. Once that decision was made, SpaceX conducted an evaluation of available composites engineering solutions and decided that Siemens PLM Software’s Fibersim™ software was the best fit for its design and manufacturing environment. “Based on our comparison, there was no question that Fibersim was definitely the best choice on the market for designing and manufacturing composite components to suit our needs,” says Kirk Matthes, SpaceX’s design manager. SpaceX’s business model is derived from the philosophy that simplicity, low-cost and reliability can go hand in hand. By eliminating the traditional layers of management and subcontractors, the company has reduced costs while speeding decision making and delivery. Likewise, by keeping the vast majority of manufacturing in-house, SpaceX reduced costs, kept tighter control of quality, and ensured a tight feedback loop between the design and manufacturing teams. And by concentrating on simple, proven designs with a primary focus on reliability, the company has reduced the costs associated with complex systems operating at the margin. Fibersim has proved invaluable within that paradigm. “Time is always of the essence for us, so Fibersim’s proven ability to take us from art to part so rapidly was a critical consideration in our decision to purchase the software,” says Chris Thompson, vice president of structures engineering for SpaceX. SpaceX has used Fibersim to design and manufacture a variety of composite parts on both the Falcon rocket and the Dragon capsule. Fibersim is being used to develop production fibre placement diagrams and laser projection files. It is also used to assist with actual fibre placement for the spacecraft’s thermal protection system, including the heat shield, exterior panels, insulating layers on the rocket and spacecraft, and several panels around the nose cone and engines. Fibersim is now being employed from the outset on all new composites projects and has enabled SpaceX to reduce the design-to-manufacturing time on composite parts, such as the 5 m fairing boattail panel by 71%, from seven days to two days. For other designs, the generation of manufacturing data was reduced by 86%, from seven days to one day with the use of Fibersim. These dramatic time savings mean that changes are processed more quickly, designs are updated more reliably and the overall process flows more smoothly. Fibersim very nicely captured the vocabulary of composites and provided an intuitive workflow, which enables our people who aren’t trained in composites to get up and running very quickly. SpaceX has used Fibersim to perform a variety of tasks – including creating designs, making flat patterns and working in conjunctionwith its finite element analysis software – and to create laser data. “Fibersim enables us to work in parallel between design and manufacturing, which is very important to us since we’re such a fast-paced organisation,” notes Derek Lies, structural designer for composite panels used on the Dragon capsule. As a newcomer to composites, SpaceX was also concerned about finding a software vendor that had significant composites experience so it could receive the necessary guidance and support as it embarked on working with new materials. “Siemens PLM Software’s support is excellent,” says Matthes. Siemens PLM Software also embeds the know-how derived from its years of experience in the composites industry to provide intuitive, easy-to-use features for the design of a variety of composite structures. The fact that this is 'baked in' to the software flattens the learning curve and makes the learning experience for new users fast and easy. This greatly aids in training new users who may not have deep experience in designing with composite materials. Since most of the composite parts are not especially complicated, the Fibersim Composites Engineering Environment (CEE) has proven to be sufficient. However, certain sections of the launch vehicle are characterised by complex curvature, so SpaceX opted for Siemens PLM Software’s Advanced Composites Engineering Environment (ACEE) to design those parts. ACEE exploits the inherent advantages of many different composite design methodologies – including structure-based, zone-based, and ply-based design – to enable efficient engineering of large, complex structural components and highly contoured composite skins. Most importantly, it helps to address the changes that inevitably occur while developing a composite structure. Based upon inputs from analysis, manufacturing or further iterations of the design, the definition evolves to its final state. This can require frequent updates and changes, which are time-consuming without software created specifically for this process. ACEE is designed to meet this challenge and create a more straightforward process for managing design changes. “ACEE provided a significant boost to our efforts to define or import laminate specifications and requirements quickly using a zone-based design methodology,” explains Matthes.